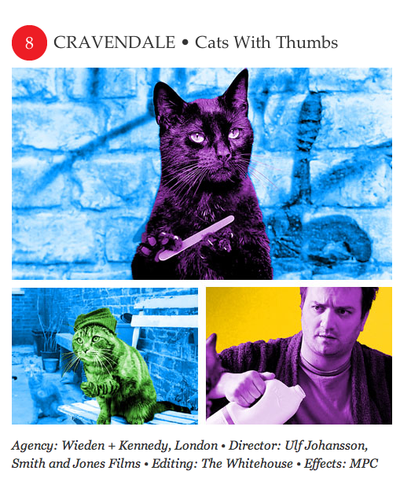 Adweek magazine has named Wieden + Kennedy’s ‘Cats with thumbs’ commercial for Cravendale one of its ‘top ten of 2011’. Why do cats stare when you're pouring milk? The answer seems obvious. They're cats. They love milk. But this irresistible spot by Wieden + Kennedy for British dairy Cravendale wondered if the cute little kitties might not have a more nefarious agenda. After a lifetime of waiting on their owner's generosity, perhaps they want to take matters into their own paws. Maybe they're ready to band together and raid your milk supply. They would need just one thing, and this spot humorously gives it to them—opposable thumbs. 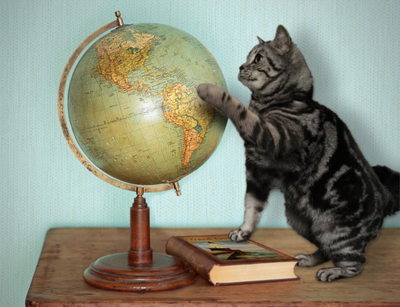 Suddenly, the polydactyl felines are seen picking up balls, filing their nails, flipping through books, and doing a little needlepoint. But they're just biding their time and honing their sinister plot. Sure enough, soon they're snapping their fingers, West Side Story style, and preparing to gang up on the selfish, cereal-eating human and steal his milk. Cats are always big in ads, but this spot chased off all rivals this year. And we may get a sequel. As one of the spot's feline stars wrote on Twitter this fall: "Know this: you have not heard the last from me." And here is the TV ad again, in all its 8th place glory. The short web film posted above is a documentary about Tokyo's finest beat-making duo HIFANA. It was produced by our colleagues at W+K Tokyo Lab. The film was released on Japan's most popular Ustream programme DOMMUNE last week. 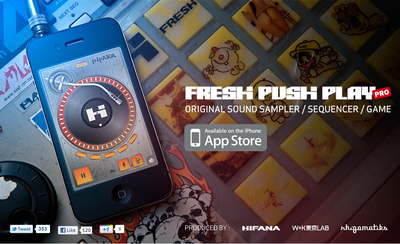 Want to create your own break-beats like HIFANA? Download this iPhone App created by W+K Tokyo Lab. Arla Foods has awarded the global advertising contract for its Lurpak brand to Wieden + Kennedy, taking over from Saatchi and Saatchi, following W+K’s tremendous success with Lurpak in the UK. 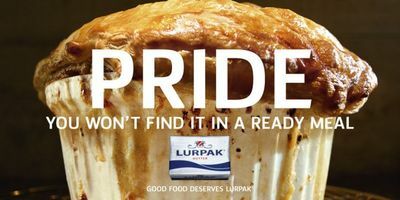 Wieden + Kennedy has been the advertising agency for Lurpak in the UK from late 2006, and since then sales of the brand have increased by 50 per cent, which equates to an extra £83m. 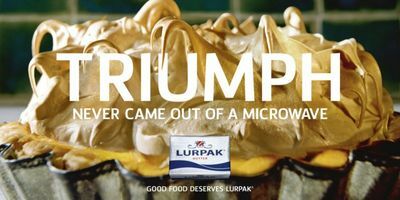 During this time Lurpak overtook Flora to become the number one BSM brand in the UK, with the sales gap between the two brands increasing by £55m. Since the launch of the 'Good Food Deserves Lurpak' campaign by Wieden and Kennedy in 2007, ROI has improved by 51 per cent. The campaign has won the brand over a dozen industry awards including: best marketing campaign in the world at the 2008 Dairy Innovation Awards; two golds at the British Television Awards; a Golden Gramia (The Grocer Marketing & Advertising Awards); a silver APG award for strategy; and a silver at the Cannes Lions awards. Nice news. 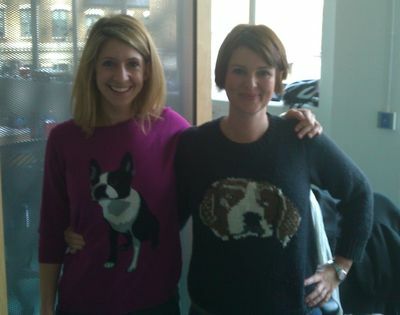 Big congrats to all on our Lurpak UK team whose excellent work has led to this appointment. 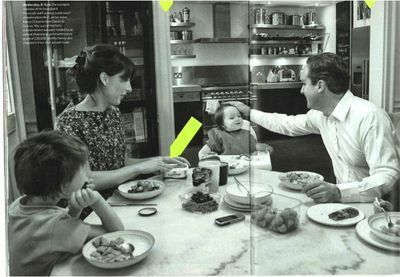 Prime Minister David Cameron and family at number ten Downing Street, recently. Let's take a closer look, brave food warriors. Yes, that's Britain's favourite butter on Britain's premier breakfast table. This product placement stuff really is getting everywhere. 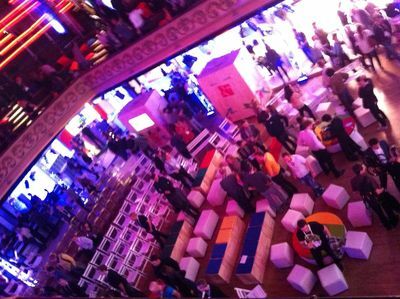 I guess writing this post signifies that last night's Google Creative Sandbox was a success. Free advertising, right? Well, nearly. They don’t do things by halves. What initially seemed like a simple plug on their product, turned out to be a first-hand, amusing experience of their Google+ video chat service, Hangouts. 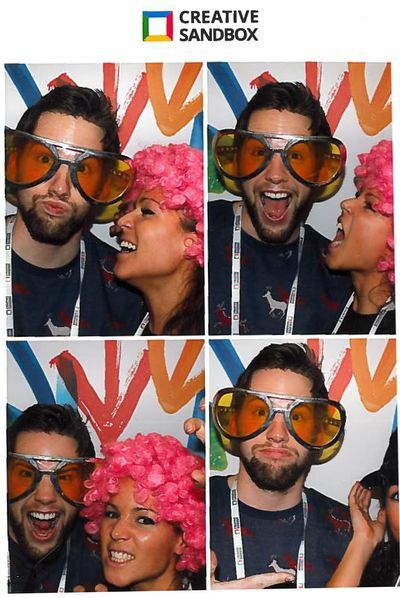 Sat in a booth in the middle of the event, you could interact with appointed people including a 'mute' caricaturist and my personal favourite, the waitresses operating from the kitchen who sent our cocktail orders directly to us. Lychee and Lavender Martinis, if you must know. We got some interesting background info on Life in a Day from YouTube's Marketing Director, Anna Bateman. There was an intro to their new campaign drive to get kids interested in Science again – Space Lab. And a good demo on their latest Android operating system, Ice Cream Sandwich. The phone software includes propitious features like Face Unlock and a data usage centre where you can restrict and manage downloads, airtime and the like. This will be especially handy when abroad as it will prevent your phone leaking data, slowly attacking your bank balance like a bullet wound to the stomach. Post talks, scoffing from the various fairground-themed food stalls and some more L&L martinis, we experimented with an app-enabled HTML5 version of the classic Duck Shoot game. Apparently due to launch before the year is out, it allows the player to use their phone as the gun to fire virtual balls at ducks on screen. Nearly as addictive as the other worldwide bird-based app, so steer clear if you are easily hooked. As the crowds fizzled out, we left somewhat merrily with fudge and the particularly stylish, ‘Googled’ cufflinks which I won in the Crane Claw. Flaming hoops, chickens, etc. 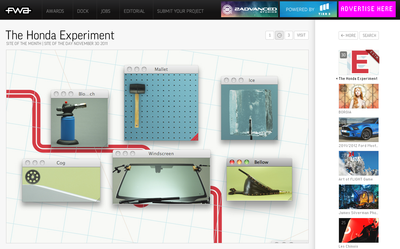 Behind the scenes in the making of our Experiment game for Honda. Oh, Jesus Christ! 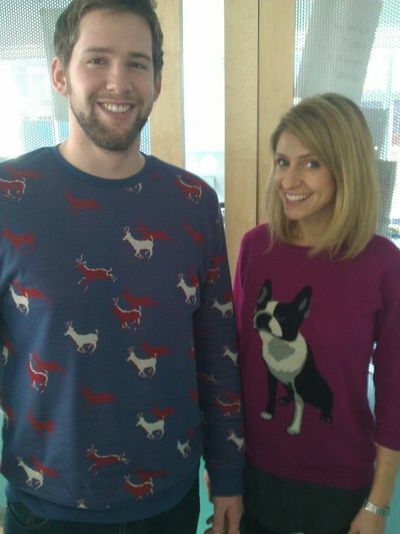 Now it's even affecting staff knitwear. To support the launch of the 2012 Honda Civic, Wieden + Kennedy London has created a new HTML5 game that pushes the boundaries of browser based gaming. 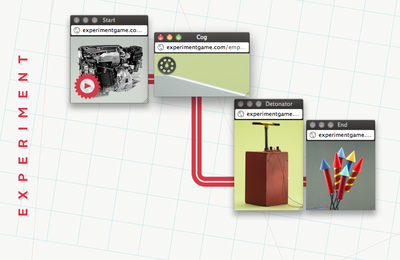 Using physics principles and played in Chrome, Firefox or Safari, The Experiment challenges players to create a chain reaction by placing a set of pop-up windows in sequence. Each video window contains an object that interacts with those around it to create hundreds of possibilities and combinations. At the end of six levels users get the opportunity to create their own chains then challenge their friends. W+K collaborated with B-Reel on the project, the production company behind the ground-breaking Wilderness Downtown launch for Arcade Fire. The game is one of three interactive experiences Wieden + Kennedy London are creating to support ‘The Great Unknown’ pan-European marketing campaign. Each experience relays part of the journey the Honda engineers undertook- how they got to the final design of the Civic and the lessons learned along the way. The first phase broke online with the launch of a destination hub on YouTube www.youtube.com/hondacivicUK. This phase introduced the campaign idea and was car-specific: the content relates to the various improvements and enhancements of the Civic. Honda Motor Europe unveiled its new Civic at The Frankfurt Motor Show on 13th September 2011. The ninth generation Civic hatchback will be released for sale in 2012. It will offer stand-out looks combined with class-leading space, and will continue to deliver peace of mind with low running costs, through Honda’s famed and unparalleled reliability. Quality and comfort levels have improved dramatically over the outgoing model. It has also been designed exclusively for Europe’s roads. The unveiling of the new Civic is Honda’s next step in their long-standing commitment to being a company that society wants to exist. Their aim is to be a business that does not cause any harm to the environment: their ultimate goal is for all their engineering to cause zero emissions. The new Civic is just one of the brand’s many ‘roads’ towards this goal. After months of wrestling with thousands of post-it notes and arguing over exactly what a blow-torch might do to a chicken, 'The Experiment' is live and kicking. 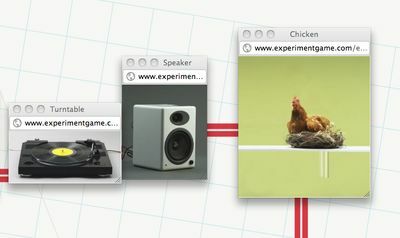 Created by Wieden + Kennedy London with the help of B-Reel, 'The Experiment' is a physics-based game played in Chrome, Safari and Firefox that challenges you to place pop-up boxes in sequence. Each video window contains an object that interacts with those around it to create hundreds of possibilities and combinations. After six levels of solving chain reactions you get the chance to create your own and challenge your friends. Have a go. Experiment. Get it wrong. Set fire to something and share it around. We've only got today to get enough votes to be considered for an FWA Award (Favourite Website Awards). Please click through and vote. If you like it. The game is one of three interactive experiences Wieden + Kennedy London is creating to support the ‘venture into the unknown’ campaign for the new 2012 Civic launch. The campaign centres around the notion that if people never venture into the unknown, they’ll never get anywhere new. In other words, pushing the boundaries of what you know is the only way you’ll ever discover anything truly unique and innovative. Each experience teaches consumers a different aspect of ‘the unknown’ and is accompanied by a series of documentaries and films with Honda engineers. The Experiment is now fully live, with the third and final experience due for release on 7th December.